Masha Titievsky of VARYFORM was profiled for the Artisan Series in the May 2019 print and digital edition of Chicago Life Magazine. Chicago Life magazine is a magazine included every other month in the Sunday edition of The New York Times and the Saturday edition of the Wall Street Journal in the Chicago area. It was mailed on April 20th & 21st, 2019. 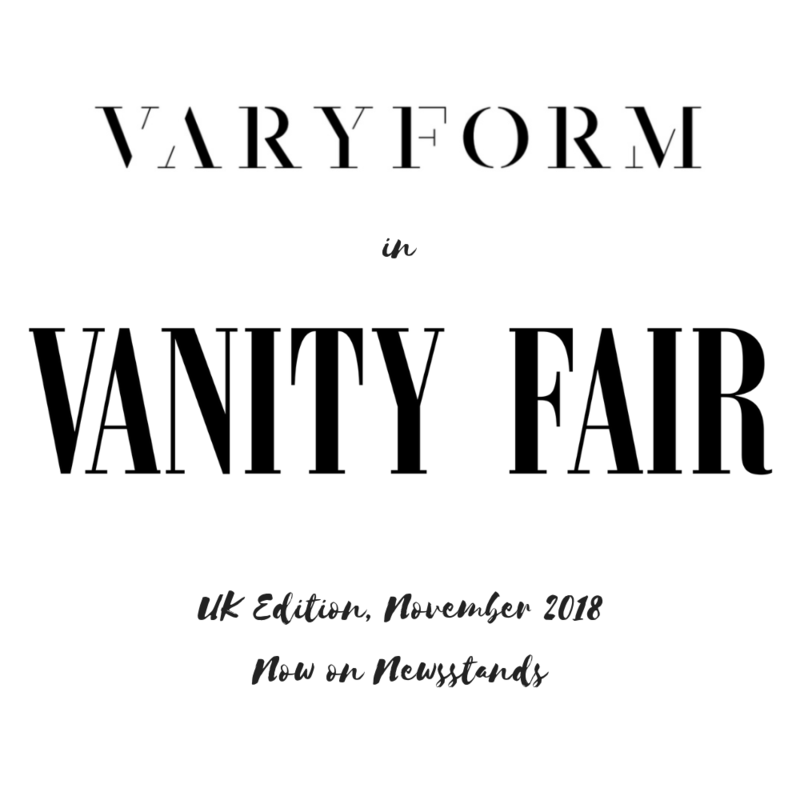 VARYFORM is included in the Elle UK November 2018 Edition alongside SW Jewellery & Decielis Accessories. Thank you to Elle & to the photoshoot team including Timothy Fernandez @timothyfernandez, Vicki Valente @vickivalente, Shannon Bowie, and Ernesto Lopez. Thank you to Vogue for highlighting independent designers around the world. We are excited to announce that select VARYFORM pieces are now available for weekly rental on DesignerShare.com. This is a great way to test out VARYFORM designer pieces at a fraction of the price (starting at $20 per week). DesignerShare offers same day delivery within Chicago and ships nationwide. View styles for rental HERE. 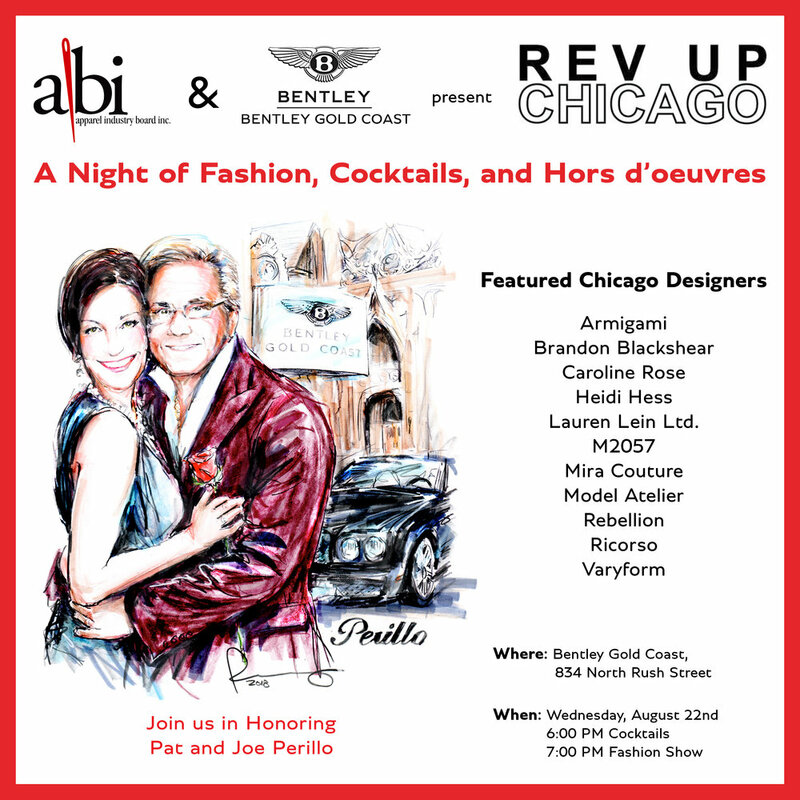 Chicago: Save The Date 8/22 for Rev Up Runway Show at Bentley Gold Coast, Presented by the Apparel Industry Board, Inc.
VARYFORM along with 10 other amazing Chicago designers including Maria Pinto, Ricorso, and Mira Couture will be presenting looks at Rev Up runway show at Bentley Gold Coast on Wednesday, 8/22 . Special ticket offer for email subscribers sent Sunday, August 5. Offer now expired. Read a recap of the event in the Chicago Tribune article HERE. VARYFORM Haven Strapless Dress ($685) appears in Tatler September 2018 in the Under Cover feature. The outer shell is a silk/wool blend twill weave with a soft sheen while the inside is fully lined. This style is available for sale through Nineteenth Amendment for standard sizes 0-12 and via custom order on VARYFORMdesign.com. Please contact us for for special offers for first time customers. Tatler is owned by Condé Nast and was first published in 1709. Today, more than 300 years later, Tatler magazine is published both in print and digitally, with a new dynamic website focusing on parties and people. Tatler's powerful mix of glamour, fashion, society, features and fun make the brand unique. Tatler magazine is published monthly. VoyageChicago.com features local artists, designers, small business owners, and influencers and has branches in LA, Atlanta, Boston, Dallas, Chicago, Miami, San Diego, and Phoenix. This is a great resource to find and support local business. Read Masha's interview with Voyage Chicago HERE. VARYFORM Aquila Wool and Silk Velvet Combo Coat featured in Tatler August 2018 in the Keep It Cool feature. The outer shell is a superfine wool crepe with silk blend velvet paneling and the lining is smooth silk crepe. Silk lined pockets add function to this fashionable statement piece. The Aquila Coat ($1380) is available for sale through Nineteenth Amendment for standard sizes 0-12 and via custom order on VARYFORMdesign.com. This style is currently on pre-sale for a limited time until 7/24/18 but please contact us for for special offers for first time customers. The "I Have A Dream" Foundation works to ensure that all children have the opportunity to pursue higher education, fulfill their potential, and achieve their dreams. I.H.A.D. empowers children (“Dreamers”) in low-income communities to graduate from college by equipping them with the skills and knowledge to succeed in postsecondary school, along with tuition support to remove financial barriers. By helping Dreamers gain access to college, I.H.A.D. puts them on a different academic and life trajectory, while having a broader impact on the students' families and the generations that follow. Follow Tasheema @tasheema_ & see her website. Follow I Have a Dream Foundation @ihdfnational & see their website. In anticipation of the royal wedding, Nineteenth Amendment has put together a post about their most elegant styles suited to Meghan Markle's style and have included the VARYFORM Haven Strapless Cocktail Dress available HERE. Over 250 guests attended a one-of-a-kind runway show featuring looks created with fabric made in RefuSHE's social enterprise, a program that fosters leadership and business skills through the design and production of hand-dyed fabrics and scarves. Nine Chicago designers had full creative license to create a look with the five yards of fabric they received from RefuSHE's Spring/Summer 2018 collection. A panel of four Chicagoland fashion experts evaluated each runway look and selected Rakan Shams-Aldeen as the winner of this unique competition. ABC7 Chicago's Tanja Babich emceed the night and the runway show was directed by Chicago fashion icon, Nena Ivon. Guests enjoyed food and desserts catered by Presenting Sponsor, Hogsalt Hospitality. All proceeds from the evening benefitted RefuSHE in their mission to empower refugee girls. VARYFORM's Luna Metallic Top was featured in the article 7 Pieces Made For The Silver Surfer on The Haute Seeker. Nina Garcia chose her favorite styles created by designers on NineteenthAmendment.com and we are happy to announce our Phoebe Flare Pant made the top 4 picks! Read about all four designers HERE and shop the Phoebe Flare Pant HERE. Mark your calendar for Saturday, October 7th! We'll be showing our latest collection at Midwest Fashion Week: Fashion For A Cause. The event is benefitting the Lynn Sage Foundation which raises money for breast cancer research.